A solar photovoltaic (PV) panel is basically just a layer of silicon crystals mixed with other elements and secured in a sturdy frame to produce clean, quiet electricity from sunlight. A single panel is actually made of many cells strung together in series. 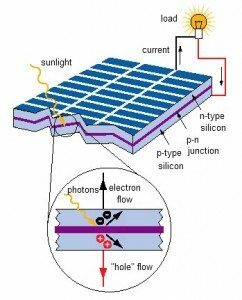 These silicon solar cells are made using either single crystal wafers, polycrystalline wafers or thin films – each with varying efficiencies of between 12% and 18%. Although we will order any panel a client may want to use in their solar system, we typically install American made Sharp 230 panels due to their superior quality, proven track record (over 30 years of excellent service) and reasonable pricing. A typical solar panel is composed of a sheet of 99.9% pure silicon that is divided into two layers. These layers are parallel to each other on a horizontal plane and each have been infused (doped) with an semi-conducting element, one having a negative charge and the other, a positive charge. Together, these p-type and n-type regions produce what’s called the p-n junction. The elements are often boron and phosphorous but other elements may be used as well. At rest within the silicon, the semiconductors create no charge. In a simplified description, the Sun’s photon’s hit the silicon and excite the electrons in both semiconductors to move freely about in the silicon matrix. While they are naturally attracted to each other, a metal strip running across the top layer of the silicon provides a path of least resistance for the electrons to move toward instead of each other. This movement is electricity. This strips connect the cells on each panel in series, and each panel is in turn connected to the next panel in series, thus creating a circuit that’s charged with direct current. Eventually, the current travels back to the negatively charged side of the p-n junction, but only after a load has been introduced somewhere along the circuit. In most cases, this “load” is typically the power panel in a house, or some other device using electricity. In most cases, the direct current is first sent through an inverter or microinverter that changes it to alternating current, or AC, the kind most buildings use. 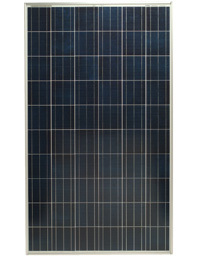 PV panels can be roof or ground mounted to provide clean electricity to your home or business. Metal roofs are no problem – thin film amorphous systems can be combined with cool metal roofs (40 yr life expectancy) allowing for less expensive panels, a long lasting & good looking roof, and no penetrations. Flat roof racking systems can avoid penetrations as well by using ballast to hold the panels in place. The ballast is typically stacks of patio bricks places in the racks to hold them down. For roof mounts, panels take up about 100 sq ft per kW and the average home has enough space to install a 2-6 kW solar system. The panels must be facing South, but can also do well facing East or West. North facing panels are NOT recommended. Prices are continually dropping and electricity rates continue to rise even conservatively at 5% per year. The math is simple and in your favor. Once you own a solar system, some or most of your energy is free for the next 40-50 years*. This changes a variable cost into a fixed cost. You can write off the interest on a home equity loan used for these purposes. There are also Energy Efficiency Mortgages available now that allow approval of a higher mortgage, as long as the extra money goes to energy efficiency. In most cases, the savings in utility bills over time outweigh the relatively small increase in mortgage payments. It’s a win-win because your home will be much more comfortable and sustainable, and your overall monthly costs lower. Currently, solar electricity systems cost about $7-$8 per Watt (depending on the amount purchased) and last about 40-50 years. Inverters need replacing about every 15 years. We offer a 20 year warranty on systems that include our modest yearly maintenance plan. If the solar array is supplying a home with access to the electrical grid, it is recommended that the system be grid-connected (also called grid-tied). In a grid-connected solar system, all electricity generated is sent directly to the grid. Your electricity bill will reflect your net electric usage or the difference between the amount of electricity your solar panels produced and the amount of electricity you used. 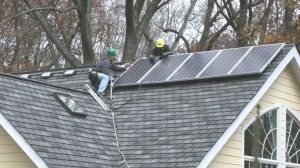 In states like Virginia, Maryland and the District of Columbia with net metering laws, the power company must purchase electricity from the PV array owner. It is important to note that if the Grid goes down and you’ve installed a Grid-Tied system, your electricity will go down as well. This is critical for safety reason. If your system was still supplying electricity to the neighborhood (known as “islanding”, there’s a very real chance of your system electrocuting a utility repairman. Solar photovoltaic panels produce direct current (DC) electricity. Direct current is one type of electrical current; alternating current (AC) is another. In the United States, the vast majority of residential and commercial appliances and equipment use AC current. Power plants produce AC current. The majority of DC current usage is for devices that use batteries. An inverter is a key component of a photovoltaic system and is used to turn DC current into AC current. Electricity can then be directed back to the electrical grid.